You’ve read all the basic advice about using LinkedIn. You know you need to fill out your profile, write an engaging headline and add a good-quality headshot. Blah blah blah. Check out some of the most popular how-to posts from my LinkedIn feed. All of these tips work on the free version of LinkedIn. LinkedIn is no longer displaying this option in my settings. I hope this is just a temporary issue rather than a change in policy. If you’re prompted to import your address book, don’t do it! LinkedIn changed the way profiles look in March 2018. The profile photo moved to the left of the page on desktop. If your background banner has important information there, you’ll need to tweak it. Follow this tip to order comments by date rather than by what LinkedIn thinks you should see first. Sadly, you can’t make this setting permanent. When you upload a video to LinkedIn, look for the pen icon in the top-right corner. This lets you add captions that have been created as SRT files. If you need to create such captions, try a service such as Rev, which creates video captions for $1/minute. This feature was released in late July 2018. The Messaging tab allows you to record up to 60 seconds of audio and send it via the LinkedIn mobile app. It’s good for your personal brand to use the same names, usernames and social media handles everywhere. After you change your LinkedIn profile URL, the old ‘ugly’ URL will still work – so any profile links you’ve shared in the past won’t suddenly stop working. It’s easy to accidentally unfollow a connection on LinkedIn. Imagine you get a lot of notifications about a busy thread. Instead of muting the thread, you accidentally unfollow the poster. Unfollowing a connection means you stop seeing their posts and articles in your home feed. They still keep seeing your posts and articles (unless they’ve also unfollowed you), and you can still message each other. By default, you follow all of your connections, and they follow you. Look at the More menu on their profile and see whether one of the options says Follow or Unfollow. If it says Follow, you must have unfollowed them at some point. 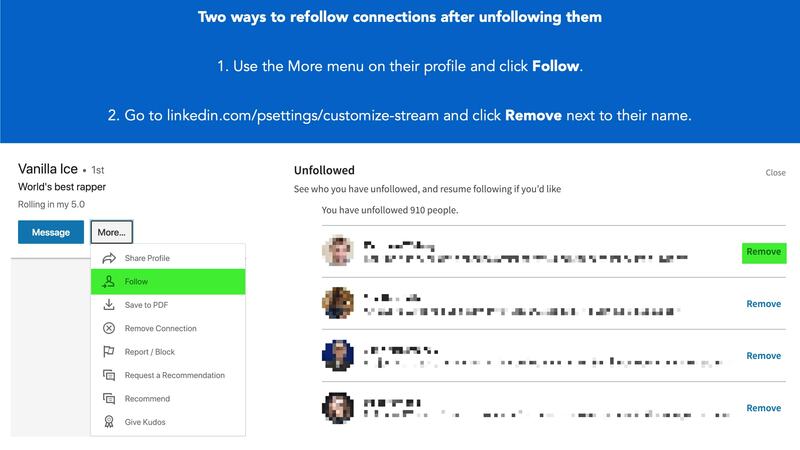 Go to linkedin.com/psettings/customize-stream and see whether the person’s name is in the Unfollowed list. This list can be quite long and isn’t in alphabetical order, so you may need to do a search on the page to find them. Clicking Remove on this page will mean you start following them again. Follow #LinkedInLearnerLounge on LinkedIn and Twitter. Not only is John simply a nice chap, he's also absolutely on top of the lastest developments, when it comes to social media and digital marketing, producing excellent guides such as his LinkedIn: how to improve engagement guide.